Unlike some Potty Personalities, Bear Cubs may not be as excited about Big Kid underpants. That’s because they may decide that filling their Pull-Ups® is a better option than interrupting playtime to shuffle off to the bathroom. How convenient are these?! Don’t worry, eventually your Bear Cub will become more interested in underwear. Until then, continue your potty parties, and allow him to pace the process. It will all happen on a Bear Cub’s groovy schedule. Introduce Big Kid underwear into your child’s dress-up clothes bin. It may end up on your Bear Cub’s head or on a doll, but that’s OK. During this playful process, your Bear Cub is getting used to the idea of underwear, and that will spark her interest. Put some Big Kid underwear in the same place as where you keep the Pull-Ups so your Bear Cub starts to make the association. When having a potty party, introduce them almost as a new party favor, and allow your child to choose if/when she is ready to put the new underwear on. Once she’s decided to test-drive those new undies, it’s likely that your Bear Cub will have quite a few wet pairs of underpants. Your child is used to wearing Pull-Ups, and as involved as Bear Cubs get in their play, she’ll just assume it’s OK to let loose in the undies as well. That’s normal. After a few soggy encounters, she’ll start to make the connection, and, she may want to continue to wear Pull-Ups because the underwear seems like a hassle. 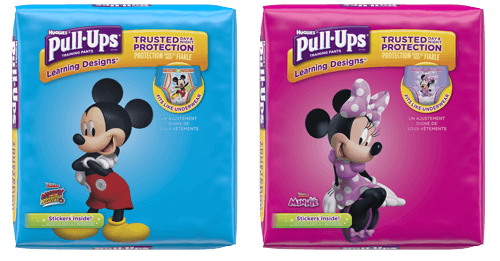 Let your child continue to choose the Pull-Ups when she wants and also continue to use the Pull-Ups® Learning Designs® Training Pants, the Cool & Learn® Training Pants, the Time to Potty App and the visual reminders to go to the bathroom. All this practice, plus watching friends and family use the potty, will eventually work its way into her awareness. Then she’ll want to be like a Big Kid, too. Over time, your Bear Cub will make the mind-body connection and establish a routine that works for her. Try not to get too aggravated, and remember: This is all part of the Bear Cub’s process.